Harmony reigns supreme in this fine French champagne with notes of candied fruit, quince and sweet almond. One bottle of Veuve Cliquot La Grande Dame. For more information on this wine, please see the Tasting Notes. Your selection of fine wine is presented in our sturdy wine crate. A complimentary card is included with your gift. Personalize It! Complete the personalization option during checkout and we'll add an engraved, silver-plated hang tag to your gift. Select one or two lines of up to 18 characters per line, or choose an elegant three character monogram. Veuve Clicquot La Grande Dame Champagne is a hand delivered gift. These gifts are delivered by one of our local design centers located throughout the United States and Canada. Same day delivery is available for most gifts when ordered before the cutoff time. 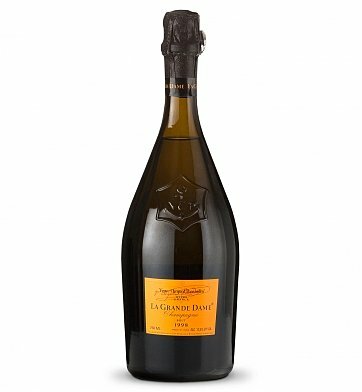 The cutoff time for Veuve Clicquot La Grande Dame Champagne is in the recipient's time zone. Veuve Clicquot La Grande Dame Brut ChampagneA delicately woven tapestry of black currant, piecrust, chalk, spring blossom and lemon zest flavors ends with a lasting note of smoke-tinged minerality. We were impressed when we unwrapped the extremely well packaged bottle of champagne with beautiful overwrap. We really feel that we received a gift. The complimentary scissors are in our car glove compartment. Thank you for the added gift. Overall, the special gray cards made a professional complete package. We will be back!